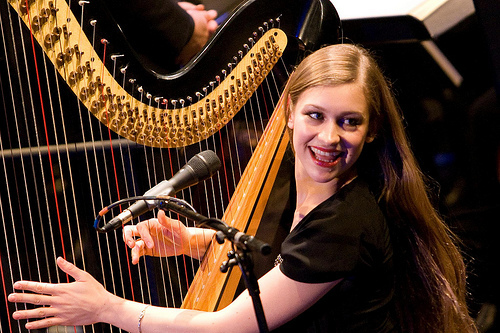 There is no middle-ground when it comes to Joanna Newsom. You either love the music of this 28-year old singer from Nevada City, CA or you hate it. And even if you love it, you wonder how her unique, challenging music will make it in this modern world of three-minute truffles and trifles. Nonetheless you love and respect her teeming talents, and wish her well. Seeing Newsom live not only confirmed her many talents, but made her recordings much more approachable. So see her live if you can, and give her multiple listens and chances to win you over. You will be handsomely rewarded. Ms. Newsom came to the Lobero Theater in Santa Barbara on Friday night, and played to a rapt crowd, including her family and ours from Nevada City. From the moment Joanna and band took the stage, we were mesmerized by her well-versed vocals, heavenly harp and plucky piano playing. And we also enjoyed the supporting ensemble, though with some reservations voiced below. We have always heard strong Kate Bush and Rickie Lee Jones influences in Newsom’s vocals, but at the Lobero we heard more of the latter in her slurred effects and jazz-inflected timbres. At other times, however, we heard Joni Mitchell and a bit of kabuki geisha (homage to Mrs. Lefort) to go with her semi-operatic intonations. Regardless, the combination is unique and enthralling to these ears (though we acknowledge that, subjectivity and music tending to pal around, her voice in particular is not for everyone). Mixed with her complex melodies and her literate lyrical tales, the net effect on us at the Lobero was absolute hypnosis. The evening was primarily devoted to supporting her recent three-disc recording, “Have One on Me,” with a few older “hits” thrown in for good measure. Newsom opened the set with her strongest suit by playing solo on harp her song ’81 (perhaps related to her year of gestation given her ’82 birth, but with multiple lyrical levels per her norm). The combination of her hands-flying, intricate, rhapsodic harp playing and vocal gymnastics never fails to amaze, and left the audience big-eyed and mouth-agape. In a word: stunning. For some stellar lyrical stanzas from ’81 that we frequently sift, see way below at *. 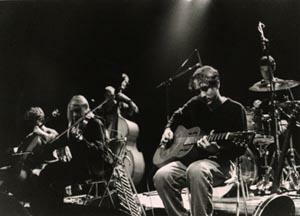 Following ’81, the band joined Newsom in earnest, with Neal Morgan on drums, Andrew Strain on trombone, a pair of violinist/vocalist females, and guitar-banjo-tambura playing arranger, Ryan Francesconi. With every part and nuance of every song seemingly scripted, it is clear that between Newsom and these musicians (with at least half of them reading from sheet music), the commitment to arrangement and structure is formidable. If there has ever been true chamber folk, this is it. The ensemble playing sounded at times like a small orchestra and at others, albeit briefly (when the reins and guard were let down), like a jazz ensemble. And throw in some startling group handclapping that smacked of Brechtian theatre and some kabuki soundings, and you’ve got yourself a tautly-delivered theatrical performance of serious reckoning. 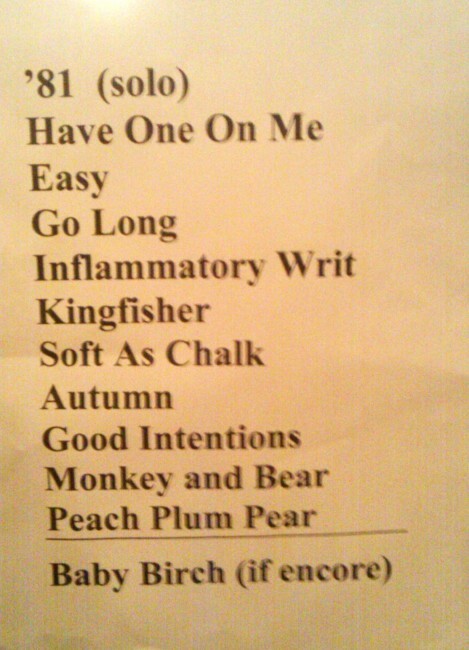 Built into her generous, nearly two-hour set were some of our favorites, including Go Long, Good Intentions Paving Company, Peach, Plum, Pear and the encore, Baby Birch. In Go Long, Newsom seems to draw parallels between the Bluebeard fable and her failed relationship with Bill Callahan and also relating to William “Bonnie Prince Billy” Oldham, though as usual, all are left to divine their own interpretation of her oft-oblique lyrics. Check out a few lyric stanzas from Go Long below at #. Another of our faves performed at the Lobero was her Good Intentions Paving Company, which is seemingly about life and loves on the road and the effect on relationships, and Joanna returning to California as a changed person. Regardless, we commend some stanzas from Good Intentions Paving Company below at ^. Did we mention that Robin Pecknold of the Fleet Foxes opened the show? While we heard some vocal talent in Mr. Pecknold, we continue to believe that neither Pecknold nor the Fleet ones can write a worthwhile melody (save their B-track Mykonos). So we give him a big meh. Maybe next time with the Foxes. I believe in innocence, little darlin’. “We both want the very same thing. when you’re ready for a change? “I will give you a call, for one last hurrah. To stay right here, in the right lane. 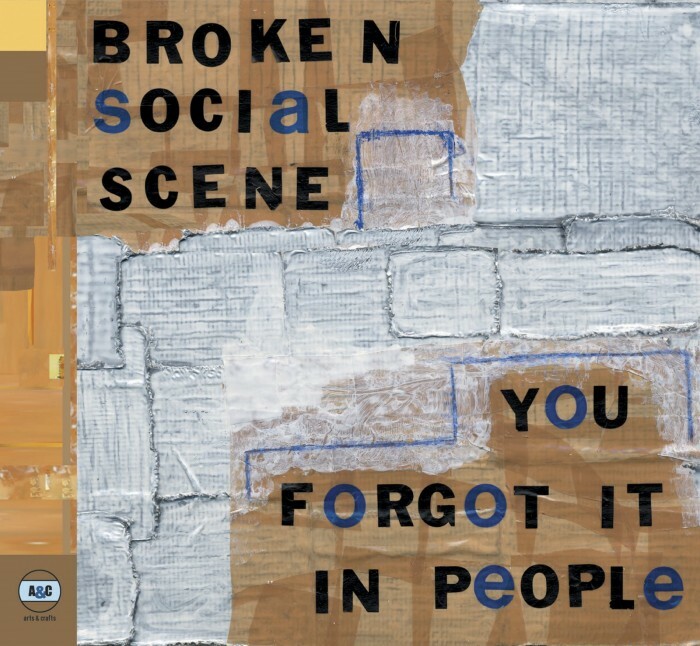 Not to digress, but we mentioned previously that we love the band Broken Social Scene. Both as a band and in their constituent parts, they have never hidden their musical hearts behind some paltry polemic or afterthought, though the lyrics would at times have you believe otherwise. With bold melodies and inventive instrumentation, these scene-sters have always laid it out for all to see, broken and unvarnished. 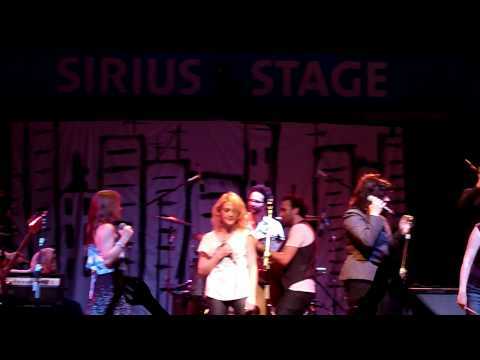 We first heard from the Broken gang en masse at the millennium’s break, followed by the first to venture from the Scene, Feist and Metric (featuring Emily Haines, who recently appeared on, of all things, the Leno show–“Boredom’s Black Hole”–and unfortunately Haines chameleoned to match the insipid, smarmy host). And then the key Scene-makers, Kevin Drew and Brendan Canning, broke out anti-socially with stellar individual efforts. And yet all of these efforts continued to be collaborative, with constituents contributing to the others’ collectives. We assume you know and appreciate each and all of the above, but just in case, check out a few songs from Drew, Canning and BSS that we return to over and over. 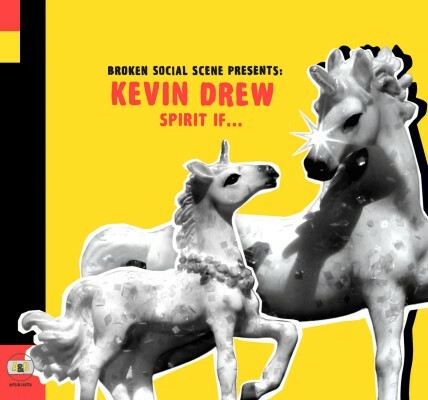 Next up is Drew’s beauteous Bodhi Sappy Weekend. We can’t completely capture the lyrics, but hold on to luminous lines. 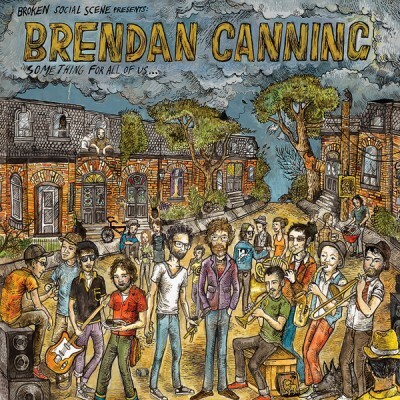 Next on the band-member hit parade is Brendan Canning, and his lucent Churches Under the Stairs. We love the “ghost notes” vocals that begin at 1:24 and the subsequent wall-of-voices approach. The song’s exact meaning is your best guess, but it moves us nonetheless. Give us some of the chosen, oh! We love the next song, Something for All of Us, and the vocals, which seem like how T-Rex’s Mark Bolan might have sounded had he survived his 70s traumas or been born twenty-five years later. And then Canning’s cunning Chameleon, which begins wordless and beautifully-horned and finishes with Feist and Canning’s great vocalisms. And now we come back to the band in the aggregate. The next song, Stars and Sons, features another bass-anchored melody line, but also with killing clapping (especially live)! 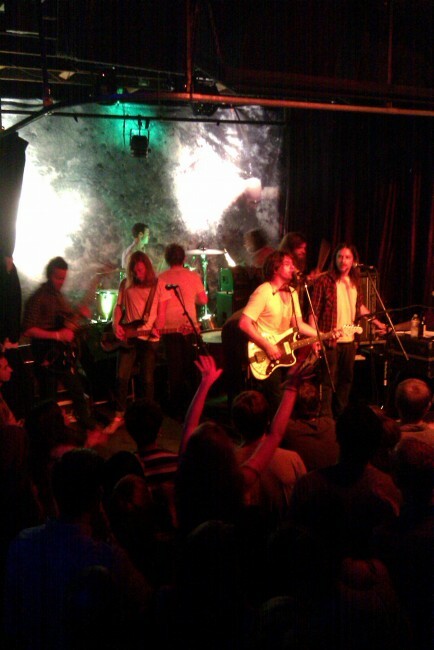 Saturdays are for the spirit and the spirited, and on Saturday the Delta Spirit boys came a ghostin’ at Velvet Jones. Sold out and packed with a rabid young crowd, the Velvet and Club Mercy played perfect hosts to this crowd-pleasing band originally from San Diego and now residing in Long Beach. The last show of a 40-night tour before heading off to Europe in September, the band threw in some new, some old, some covers and some rarities, and delivered on all fronts. If you haven’t seen or heard them, they are a fervent, soulful group, and particularly live. Leader Matt Vazquez (no not the professional baseball pitcher from Santa Barbara) is a talented vocalist who can impressively hit all the notes live. He is backed by a great four to eight piece band that swells to at least eight (we lost count actually) onstage at times for added pounding, percussive drive. Delta Spirit aren’t breaking any new musical barriers, but they cover the waterfront stylistically with flourish on their instruments and with stylish vocalistics. On the crowd-pleasing anthems they sound like an indie-Springsteen (note: Club Mercy brings the similarly-veined-in-that-regard band, Hold Steady, to Velvet Jones on Aug. 27th). At other times they play the blues belters (on a Louie Armstrong cover for example), and at others the plaintive Americana soulsters. The band knows and represents well their influences, and frequently whips up the crowd into a clapping, singalong fervor. And for good measure, they threw in a spirited cover of Pink Floyd’s Wish You Were Here (with the young crowd bizarrely bellowing along to every word–is there a Pink Floyd resurgence we don’t know about?). They left it on the stage and the crowd left satiated. Check ’em out next time. In case you missed them, get ready for their next visit by checking out the band below. Vivian is a particularly touching song by Vazquez about his grandparents, and his grandmother in particular. We heard the news last night, and it weighed us down. Our hearts go out to those who lost their lives at the Love Parade techno music festival in Duisburg, Germany yesterday, along with their families and friends. Words fail. But music doesn’t. Almost immediately we thought of the great Clem Snide, and Eef Barzelay’s stunningly and eerily relevant song. Different contexts and messages, perhaps, but the devastation is nonetheless similar. Once again Eef has provided the perfect soundtrack to our lives. 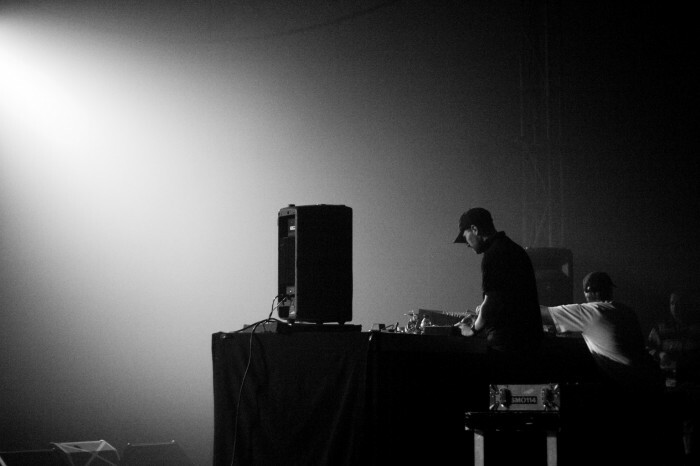 And then of course we thought of Flying Lotus’s mournful dirge, German Haircut, which seems so fitting this morning. Peace to you. The main events of “The Pregnant Widow” are set in the summer of 1970 at a castle above an Italian village in the Campania region. Amis’s narrator looks back on that time in the castle from a 21st century vantage and ruminates on the characters’ lives and society’s evolution or devolution. College students from England have come to stay in the castle: the protagonist/narrator, Keith; his girlfriend, Lily; a captivating blonde with the suggestive name, Scheherazade, as a collection of couples and acquaintances come and go, all runwaying throughout the pages and flaunting the appetites of their youth and the era. Despite the vitality of this time and these characters, towards the end of the book we discover that Keith’s life has been largely a professional and personal disappointment, and that he pinpoints that summer in Italy as the time when the wheels started falling off. To this end, the title of the book is borrowed from the Russian writer, Alexander Herzen, and refers to an old order about to be upstaged by a new one: “The departing world leaves behind it not an heir but a pregnant widow,” Herzen wrote, “a long night of chaos and desolation” in which the old is gone and the new has not yet been born. 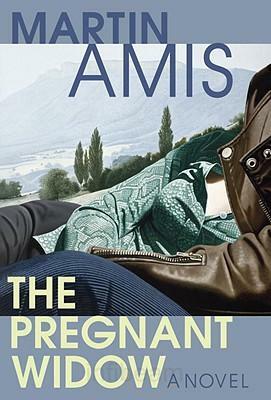 Interestingly, Amis has said elsewhere that the novel is “blindingly autobiographical” and, you can’t help but believe him. We can’t help thinking of Martin’s father’s (Kingsley Amis’s) taunting observation: “Aren’t they nice, the young? They have stayed up for two years drinking instant coffee together, and now they are opinionated – they have opinions….” Correspondingly, Martin remarks on the young and their nostalgia: “Nostalgia, from Gk nostos ‘return home’ + algos ‘pain’ ‘the return-home-pain of twenty years old’.” So take that, father. We remember our nostalgia and feel it in our own. We’ll leave it to you decide whether or not to read the book. And with that we give you below some dips into Amis’s writing from the book. You can then decide whether to dive deeper with the Widow or be satisfied with the sampling and instead sun in the shallow end. We will admit that we have fallen short. Again. Life shifted into vitesse-mode in the last month, and we neglected a muzzle-load of new music that was shot out in May. On one of our favorite days of the year (May 18th), Band of Horses released their third record, “Infinite Arms.” Like their last record, “Cease to Begin,” the new one took a while to grip us. But now we can’t escape its clutches or get it off the player. We have been fans of this band from their beginning. On the new release they have bolstered their sound and added even more harmonies, supplementing the normal guitar-driven, reverb-heavy lead vocals to great effect. 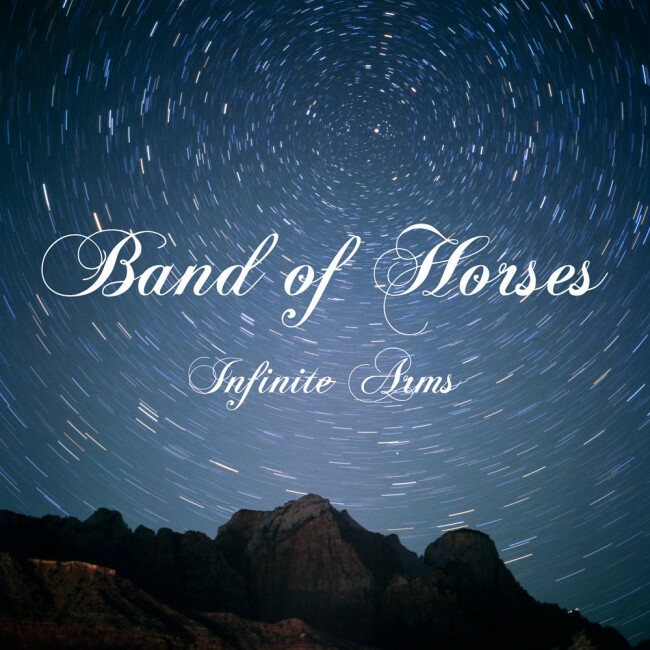 Though it’s getting to be a bit cliched, we cannot get enough of this new epoch of harmony-heavy vocals (with allusions to the Beach Boys and other harmonic convergences), and the Band of Horses have favorably joined the fray. While we lament the Horses’ frequently tenebrous, homily-ridden lyrics, we admit that when combined with their oft-majestic music, the soulful effect is repeatedly breathtaking. On No One’s Gonna Love You we hear in the repeated chorus a comforting voice from on high. 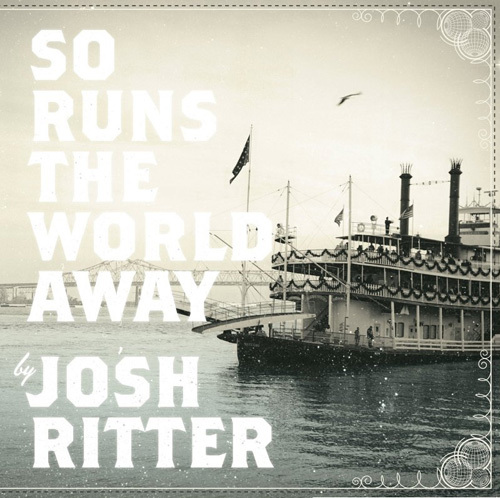 We have been fans of Josh Ritter since his first formal release, “The Golden Age of Radio,” back in 2001. Though the spawn of two neuroscientists and raised in Idaho, Josh had a Midwestern air about him (with his references to Lawrence, Kansas and “dry land farming”). And we Leforts are suckers for the Midwestern touch and so were immediately smitten with Ritter. But beyond the geographical allusions and pull, we have come to know Ritter as a phenomenally talented and engaging songwriter, regardless of locale. He has a flair for both bereaved ballads and upbeat ululations filled with mark-hitting melodies and well-turned phrases. Check out a few of the gems off of each of his new one and his first one below. And check out Ritter’s simple, but affective cover of Modest Mouse’s Blame it on the Tetons here. Years can go by and then you hear an older song anew, and you shudder and think of all that has escaped from the funnel of musical truth. We experienced this the other day when we rediscovered the song below by Lullaby for the Working Class (on Saddle Creek Records and featuring Ted Stevens who would move on to be a part of the grand Mayday and Cursive) and later debated whether it was the locale, the group of talented artists or the meteoric, creative scion that ultimately gave Omaha its new meaning. Talent and horizons for days, regardless. Athens, Seattle, Omaha, Brooklyn, Portland–the circle remains unbroken. Next? Listen in. Vincent Van Gogh comes to a lawn chair near you. Lullaby for the Working Class–Spreading the Evening Sky with Crows. Wielding “hits,” hair and high-vocals, Built to Spill came to Soho on Tuesday and easily satisfied their ardent fans. The Built ones caught our attention when we first heard their “Perfect from Now On” record in 1997. From the beginning the band has had an uncanny ability to mesh a heavy, but intricate, choral-guitar sound with the high, oft-forlorn vocals of leader Doug Martsch, and to stitch it all together with oblique, but weighty and galvanizing lyrics. They accent the sound with a dollop of prog, a mantle of metal and, most importantly, marauding melodies. We have always been fans of male vocals at the high, nasally end of the register, and Martsch’s vocals fit perfectly in that genre’s continuum from Neil Young, to Wayne Coyne (Flaming Lips), to Ben Gibbard, to Yoni Wolf (Why?). After “Perfect”, the band followed 1n 1999 with universally-acclaimed “Keep it Like a Secret,” which took the band to further exalted heights. And it wasn’t long after the latter’s release that BTS came to the lamented Yucatan in Santa Barbara and regaled the crowd with its extended, innervating floor show. Martsch’s inventive, Stratocaster-anchored guitar-playing has always been at the core of the band’s appeal, and at the Yucatan Martsch and the band were incendiary, burning down that hot-house that night. We confess, though, that while we appreciated their subsequent “Ancient Melodies of the Future,” after the Yucatan our interest in BTS somewhat waned. First to contribute to the ebbing was a good, but comparatively disappointing, show at Slim’s in San Francisco. And then their “Live” record, with its 20-minute (each) Cortez the Killer and Broken Chairs cuts, left us reaching for the skip button. And then the band went on hiatus and released a couple of, for us, marginally interesting records. But when we heard the Club Mercy call and a couple of musically-respectable friends chimed in, we decided to venture down to the sold out show in Santa Barbara. So we were somewhat surprised that when the band took the stage, we were immediately mesmerized again. They led off with Liar off of 2006’s “You in Reverse” (one of those “marginally interesting” records we mentioned). With his bobbing head and swelling vocals, Martsch (each time looking more and more, for you historians, like 20th U.S. President, James Garfield) drew us in. It’s a great, newly-appreciated song, and for us was the highlight of the evening. Which is not to say that the rest of the show was not similarly captivating, as the band’s head-tossing, lyric-echoing, dancing fans will attest. Soho held a great, devoted crowd who knew every lyric to every song, and let the band hear it. The band delivered all their “hits” with admirable aplomb, and we enjoyed the hirsute, melodious attack throughout. But we may have been spoiled by the lofty-heights of that early Yucatan show and the brilliant immediacy of “Keep it Like a Secret.” Perhaps it’s a mellowing with their and our age. Who knows? While we love this band and seeing them live, these days the passion has understandably played out a bit. And that was the missing link for us Tuesday night. Regardless, the band delivered a completely satisfying show to its sold out throng at Soho. If you haven’t heard or listened recently to Liar, check it out below. 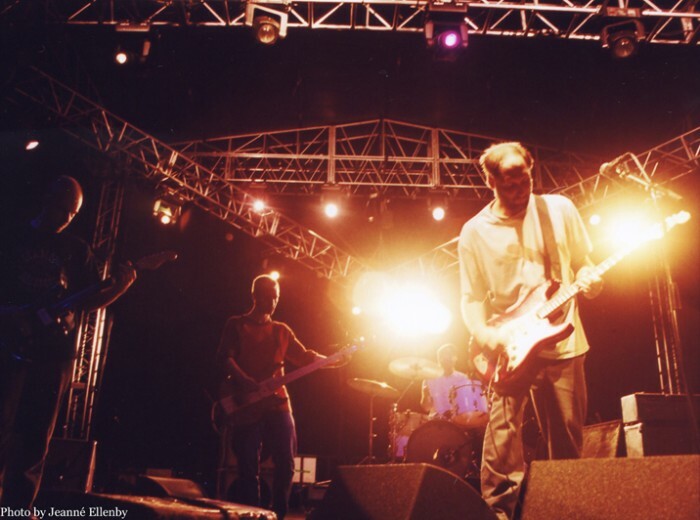 And if, for whatever reason, you haven’t heard Built to Spill at all, listen in to a few of our long-time favorites below it. Check out this song’s slow-burn build until the core of this gem kicks in at 2:04. According to Tom Waits, sometimes you fall out of a window with confetti in your hair. At other times it’s a song that falls like confetti into your consciousness from beyond the constellations. We were driving home this week when Broken Social Scenes’ Anthems for a Seventeen Year Old Girl suddenly came on the car stereo, with Emily Haines (now Metric, or solo), Feist and friends nailing it. Once again the favorable force of music met us head-on. Ask those who know us, and they will attest to our (some would say annoying) willingness to take any two-to-three words you might suggest, and invoke the lyrics of a song from years past. We can’t help it. But at other times, we are caught out and have no words to match the visceral slam of a song. When Anthems for a Seventeen Year Old Girl came on we happened to have with us a girl who just turned seventeen years old. It had been a long time since we had listened intently to this song, but suddenly the song floated ponderous and weighty into our ears. When moments like this happen, if you’re not careful, these convergences of music and circumstance will leave you in a heap, murmuring, maundering and muttering. We reckon a reckoning is coming next June, and we are dreading the emotional wreckage. As set out below, the song seems to be about a girl’s loss of a girlfriend to change and transition. You could, however, construe the lyrics in other obvious ways. But for the first time, we heard the lyrics to be about our seventeen-year old passenger and her seemingly imminent departure to a life all her own. And the effect was enough to stop the world and our car, in addition to our words. 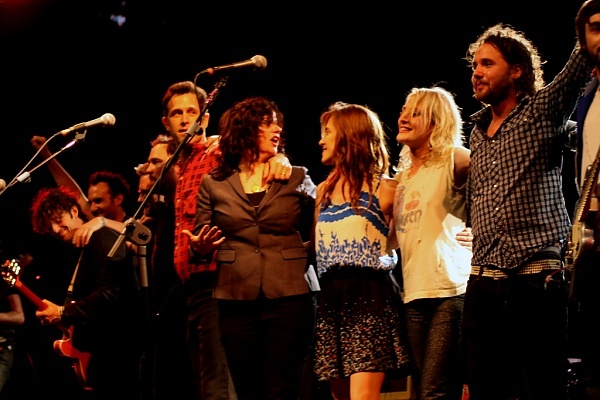 As we have often found with the songs of Broken Social Scene, it’s the music that carries the day and the lyrics oft-times supply the missing element that conveys the life-and-death situation. Anthems is certainly not the best song from the BSS discography (more about this soon), but when it came on during our drive it seemed near-perfect. And here’s a worthy live rendering to check out, with Emily and Feist firing towards the end. Such was the moment Thursday when Anthems for a Seventeen Year Old Girl came on our car stereo.